As reported earlier this month from Paris, there are many bridges on the Seine that are decorated with 'love locks'. The trend has spread to many other cities. 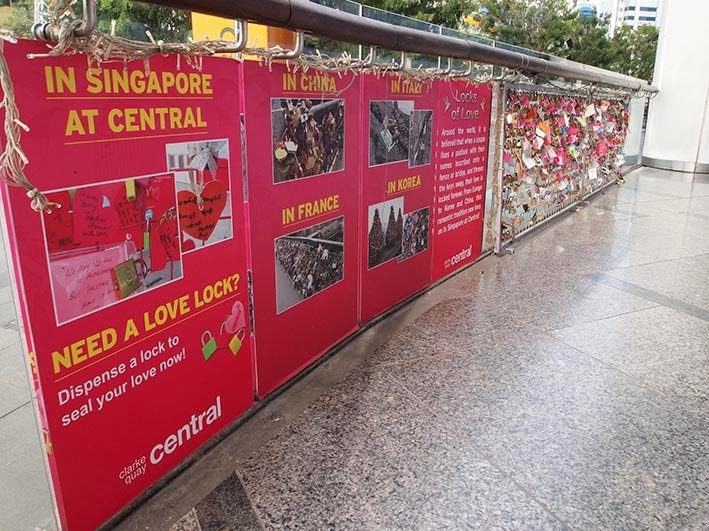 While walking along Clarke Quay today, I noticed that Singapore has its own location where, according to the handy instructions on an adjacent poster, you can 'dispense a lock to seal your love now'. It's not on a bridge, but on a three-metre metal frame placed against a glass balustrade in front of the Central mall. That should certainly get the tourists flocking in. Update: according to a Daily Telegraph article, the Pont des Arts bridge in Paris was closed recently as a section of railing collapsed due to the weight of the padlocks. I wonder how long Singapore's love locks will last under this health and safety nightmare scenario?